From WaPo: Washington Monument Subtly Fortified. The monument grounds have been closed off with ugly fences and walls for over a year now, while largely undocumented security enhancements were installed, but it looks like the walls finally come down on Monday, July 4th. 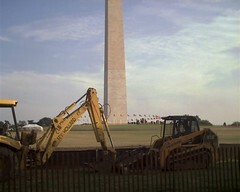 I look forward to checking out the newly relandscaped grounds when they open on Independence Day. That area has been closed off to DC for far too long. Hopefully the asphalt strip around the base of the Monument will still be as great for rollerblading as it was two years ago.